In Kenya it's estimated that one in seven people live without access to electricity. Sixty eight percent of Kenyans rely on kerosene as their main source of energy. Kerosene is expensive as a fuel, and can be dangerous as a flammable in the household. 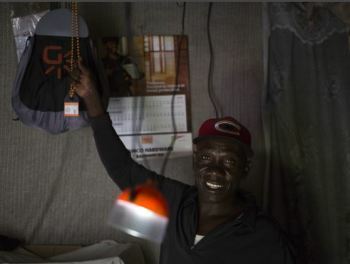 GravityLight is one of several startup companies working to make clean and renewable energy and lighting available to families in Kenya and around the world. The foundation has partnered with Shell to send more than 3,000 lights to families in Kenya. GravityLight had already proved itself as a great easy source of energy - I'm a huge fan of the idea and devices. The basic idea is that a large weight is lifted up, and as gravity pulls the weight down a gear train is activated to power LED lights. One thing that Jim Reeves wanted to improve was the usability of the product. If a child was studying alone they might not have the ability to lift 12 kilograms of rocks, limiting their access to the light. This new redesign incorporates a winch so that anyone can pull the winch to lift the weights and gain twenty minutes of light. The GravityLight Foundation is currently building and testing its Kenyan manufacturing process. 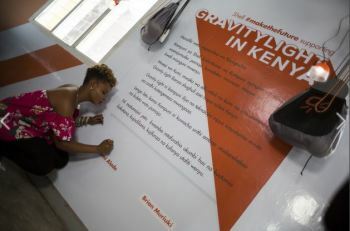 This large scale light giveaway is part Yemi Alade's fifty night tour of Kenya to promote the GravityLight initiative. The tour will have a stop at the Daraja Academy, a girls' school that works to train the leaders and STEM workers of the future. This is one of several initiatives that Shell is working on as part of its #MaketheFuture campaign, designed to bring cleaner energy to the world through innovation. Bringing this many devices to Kenya is an amazing project. There's definitely a polished public relations angle to this initiative but the work that is happening is good. Educating people about the health benefits and cost savings of a gravity powered generator instead of kerosene is a great engineering service project.